Full disclosure: this is from a starred review. 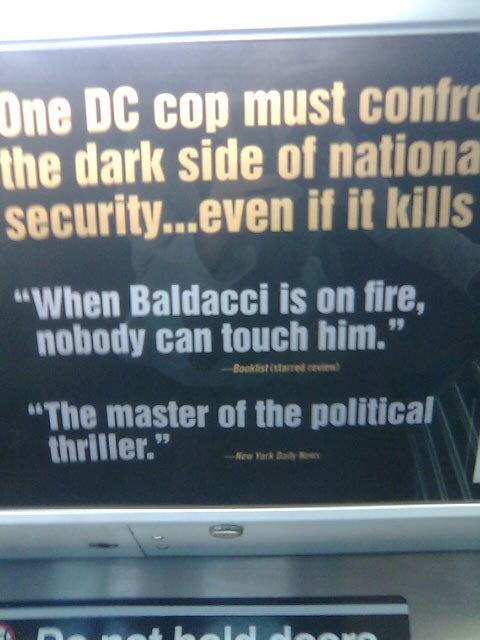 And to be clear, this is not about David Baldacci. The man sells a number of books, none of which I have had the opportunity to read, so I am without the ingredients to form an opinion. 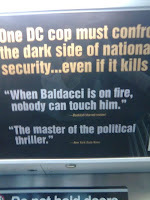 This is about the ubiquity of the blurb and the hilarious results that can occur as a result. I alarmed a number of people on my morning commute with peals of laughter over this advertisement for True Blue. I think a fun game to play would be to blurb a classic like a new release. It could last the ride to work or the rest of your life, depending on how hard you played. "In a world where nothing is as it seems, one man dares to transgress against the boundries of race & sexuality in a desperate bid to stop a madman's obsession from consuming them all." No way, call me Ishmael, but hahah!